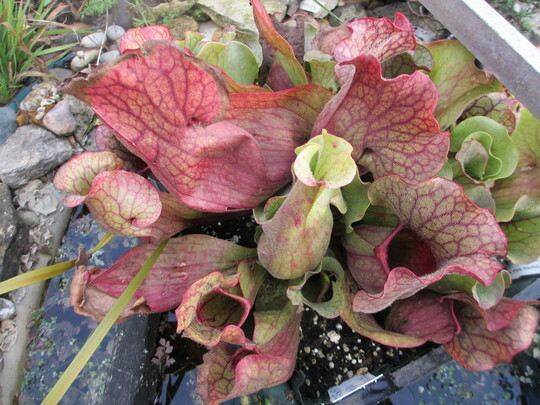 Thanks to LORI for the information about purpurea Pitcher plants surviving in the harsh Canadian winters. As cultivar Vogel has done do well since I bought it in 2016 I decided to divide it and leave the original outside in the pond. The water was frozen last week, but there is no frost damage at all on the plant and the pitchers are awaiting their first victims. Previous post: Flowering at Home yesterday 4th December. That is lovely. I spent ages looking at these beautiful plants on Hampshire Carnivorous stand at Chelsea this year. There were so many to choose from but in the end I didn't get any as I thought they would be really difficult to grow. As you say yours was not affected by the ice perhaps I should try. That great it survived the frost such a pretty patern on it too. I hadafly in my house three weeks ago and this morni g I could see two midges in my garden so there must be plenty of food for it now. I just can never believe they are fully hardy! Its amazing isn't it! The close up is very beautiful. Ginella, Thats from whom I bought most of my Pitchers. 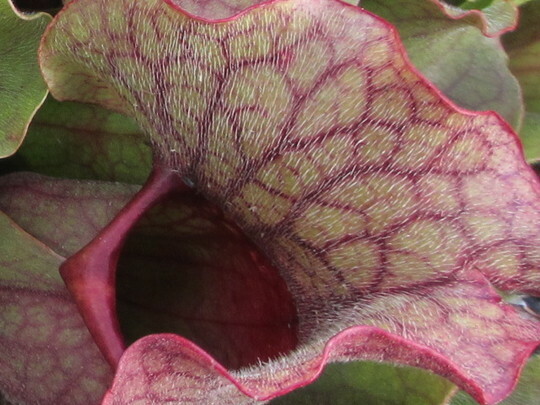 I've a small collection of Sarracenia now. The southern USA ones from Florida or Georgia are not hardy, but the northern ones are. They are not difficult IF they are kept moist with rain water and in a peat growing medium. 3pb, they do like a cold period of rest in the winter. Unless you are a fly, Karen, imagine sliding down those little hairs all facing down it's throat. Oh that's brilliant! I wish we had persevered with ours, because they are beautiful aren't they? Thanks Siris, I am going to Chelsea again this year so will have another look. My garden is S/W facing so very sunny. I do have some shade under the hazel so maybe that would be the place for them? Thank you for letting me know Siris it's handy to know they with stand the cold. Ginellie, Full sun is ideal except they must be kept in about an inch of rain water throughout the year, except during winter, when just moist is ok, and Not in garden soil. My Pitchers are in a floating polystyrene raft with holes cut in the bottom for the pots for them to sit in the water. The pond water is rain water off the conservatory roof. wow that is stunning. how did you make the polystyrene raft? that seems a wonderful addition to the pond. SBG, the polystyrene raft was made from the top packing piece from a washing machine. It's square and got small edge upstands. I cut holes in the bottom to slot pots into, so they just sit in the water. As the water evaporates in the summer in the pond the floating raft lowers till this small pond is topped up, only with rain water though. Oh and I painted it black, more aesthetically pleasing than white. Variegated water celery stems grow around the pots, looks quite pleasing. Thanks for that siris, I will see if I can get any polystyrene. Darren, those Nepenthes Carniverous Plants are spectacular, unfortunately definitely not hardy.